Since 2013 next-generation sequencing (NGS) targeting genes mutated in diffuse gliomas is part of routine diagnostics in our institute. In the present report, we evaluate the use of this custom tailored NGS platform on 434 samples. The NGS panel assesses mutations in ATRX, CIC, EGFR, FUBP1, NOTCH1, PTEN; H3F3A, IDH1/2, PIK3CA, and BRAF, amplifications in EGFR or MDM2 and copy number alterations (CNA) of chromosome 1p, 7, 10 and 19q. TERT promoter mutations were assessed separately when indicated. Of the 433 samples of individual tumors with NGS data available, 176 cases were diagnosed as grade 2 or 3 glioma (40.6) and in 201 patients a glioblastoma (46.4%). Of the remaining 56 patients, 22 had inconclusive histology. 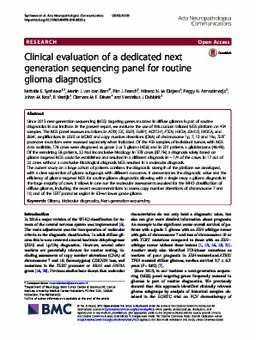 In 378 cases (87.1%) a diagnosis solely based on glioma-targeted NGS could be established and resulted in a different diagnosis in ~ 1/4 of the cases. In 17 out of 22 cases without a conclusive histological diagnosis NGS resulted in a molecular diagnosis.The current study on a large cohort of patients confirms the diagnostic strength of the platform we developed, with a clear separation of glioma subgroups with different outcomes. It demonstrates the diagnostic value and the efficiency of glioma-targeted NGS for routine glioma diagnostics allowing with a single assay a glioma diagnosis in the large majority of cases. It allows in one run the molecular assessments required for the WHO classification of diffuse gliomas, including the recent recommendations to assess copy number alterations of chromosome 7 and 10, and of the TERT promoter region in IDHwt lower grade glioma.